Kolau had the pleasure of speaking with Jake Hammer, the owner and operator of Everett Street Autoworks in Portland, Oregon about how his business conducts their auto repair marketing efforts. Hammer has been with Everett Street Autoworks for 13 years. 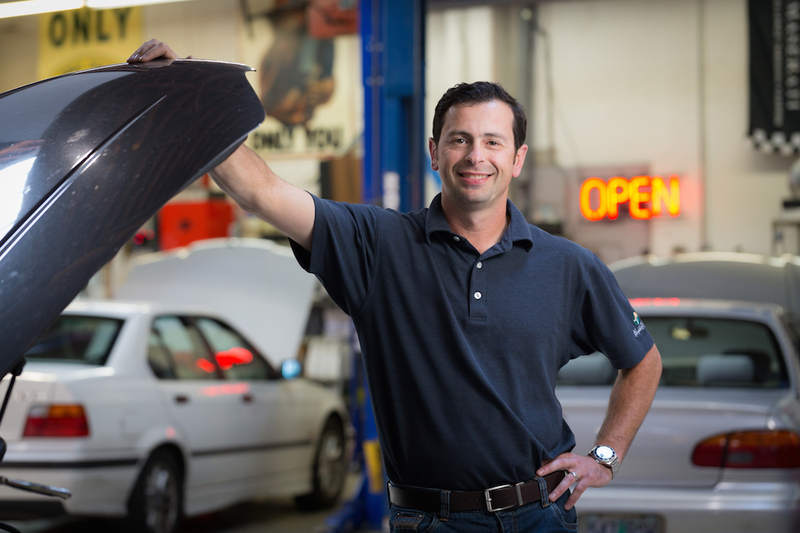 After taking control of the company in 2007, Hammer has helped it become one of the largest and most successful auto repair shops in Portland, even earning a 5 star rating on Yelp. Hammer discusses how he combines his auto repair marketing efforts with customer service to drive his shop’s success. What is it that sets Everett Street Autoworks apart from the competition? Jake Hammer: We focus on more than just the service or the product when it comes to our auto repair business. We focus on customer experience. I always tell my guys that you can essentially do everything right but if the customer doesn’t experience or perceive it in that way either you qualified it wrong or you did something that didn’t live up to their expectations. Therefore, you need to make it right even if it was not your mistake. So the root is qualifying. I think we do a good job of making sure we understand each situation and meet the expectations of each customer and if we don’t we’ll make it right. Do you train your staff on customer service? Yeah, but it’s more just internal. It’s not like a customer service training program that’s documented and written. It’s more like you are just thrown into the fire. You’re working with people who have been doing it for a long time and you learn, ask questions, and go from there. Is it your good customer service that drives people to leave good reviews on Yelp? Yes, we don’t do any external outreach to tell people to leave us reviews; we never have. In my experience, we got big on Yelp early on. I think we were the first auto repair shop to get a Yelp review in Portland. Yelp has been helpful because when someone moves to a new city the first thing they look for is a new hairstylist, a new auto repair place, a new drycleaner. An auto repair shop is just one of those services that people quickly look for after moving. Yelp was influential especially for people transplanting from California where Yelp was already a huge thing. When they came to Portland and would go to Yelp there was no one but us. So for a while around 2008-2009, we got a ton of business from Yelp because we were one of the few that were listed on it and had positive reviews. And so that was a big deal. Do you take the reviews on your website from Yelp? Or are those submitted to you? We just signed up with a new company that does our website. I think the website displays a hybrid of reviews taken from Google+ and from surveys sent out by our website host provider because they do our CRM. So the reviews on our website are independent of Yelp but they are making some Yelp ones that are linked on to our website. Is the majority of your traffic brought in by Yelp reviews or word of mouth? From an analytical standpoint we get more hits to our website from Yelp than any other source. What is the most effective way to bring in business? Through Yelp? The most effective way is always word of mouth. There is nothing better than someone vouching for you personally. Independent of that the best ones are through social media platforms or internet platforms similar to Yelp like Angie’s List, Google+, Facebook. That kind of stuff. What channels do you use for auto repair marketing and to promote your business? Do you use Facebook, Twitter, and Instagram? Yes. We’ve been bad at updating our social media accounts lately but we have all of those. We were good at it for about the last year. But in the last month I’ve been really busy so I haven’t kept up with it. We are pretty big in all of those social media platforms though. I had someone who did it all for us but when we transitioned websites about a month and a half ago I transitioned our social media as well. We intended to bring it on in house but we haven’t done that yet. What type of content do you post on your social media channels? A little of everything. Pop-culture, funny stuff that may relate to auto repair. We did a couple drawings that would engage our followers so we asked people to tell us about their first car. People could post a picture of their first car and a description of it. Once we get all the submissions in then we would do a drawing of who won. Simple stuff like that. Do you use Google AdWords for your auto repair marketing efforts all? We just started using Adwords but we don’t have a big budget at all. The company that we hired to do our website signed us up ,and I haven’t gotten a report from them yet because July was actually our first full month doing it. Why did you choose to start using AdWords? We decided to do it because they gave us a very low budget, and I thought it was a very good way to target a specific area of the business. So the goal is that we could turn on one area of the business that seemed to be slow or one that we really wanted to grow and focus on that. Before you hired a company to run your website were you doing it in-house? No, a girl was doing it locally. The company we have now is auto shop specific so all they do is deal with independent auto shops around the United States. The people you are talking to know the exact KPIs that are pushing your business so they are a little bit more on the same page. They can give you advice about what other companies in the United States are doing and which programs have been successes or failures. Do you like using the company to run your website? Yes. I mean it’s only been a month and a half but it has been working out well. Did they change a lot of things on your website when you started using them? You know not a ton. They just changed the layout design but for the most part a lot of the verbiage and the idea of it was already there. Do you advertise in any offline channels like magazines or newspapers? Very few but yes we do. We do the Northwest Examiner which is a neighborhood publication. We also do Portland Heights Living which is a Southwest Portland magazine. We advertise in it because it fits into our demographic. When choosing an auto repair shop either you live close or you work close typically. People want a conveniently located shop. Typically, people look for three things in an auto shop: convenience, trust, and price. One of the those three things pushes customers to go somewhere. So for our target demographic it’s mostly convenience, then trust, and finally price. Therefore, auto repair marketing is pretty targeted. Do you see a lot of repeat customers or mostly new customers? Yes, we see a lot of repeat customers. We probably see roughly 60-70% depending on the month. How do you feel about giving discount? Do you find that it helps bring customers in and/or keep customers happy? I saw that you currently have two different discounts listed on your website. So that’s new to us as well. The company that’s doing our website now, that’s part of their deal. Historically discounts aren’t something I mind giving. Problems with discounts can arise from things like Groupon because then you can get a lot of bottom feeders who aren’t really looking for anything but price price price. And where we are located and what we are trying to do that is not really good for us. On the other hand, if you have a good customer, who takes care of their vehicle in the appropriate way, and is someone who advocates for you then discounts are awesome if you can provide it to them. Then it is a win win because they will continue to use your business and refer you and you can give them a certain percentage off their bill. Would you ever advertise your business on Groupon? We have before. It worked out real well for us only because we are different from other industries. We have some good services where we can give someone something of value but still make money unlike restaurants that were losing money because they were handing over free food or something. We can also set up our schedule more appropriately than a lot of restaurants. So it was good. I did learn from it. There was one run that we did that wasn’t beneficial. We did an oil change promotion which was pretty awful because you don’t make much money and then you way over sell it and people want to come in right away. But we did one for alignments that worked out really well. What advice can you give to an auto repair shop that is struggle with customer acquisition or customer retention? There are two basic rules. The first rule is that the customer is always right. And then the second rule is if the customer is wrong read rule number one again. Just follow that and understand that you have to swallow your pride even if you did everything as best as you could. Either the person is a crook and out to get you or they never were fully on the same page as you. Maybe there is even a chance that you didn’t set up the situation appropriately or they didn’t experience the situation appropriately. Either way you need to make it right, learn from it, and never try to do it again. Whether it’s how you sell something or the end product. Nowadays with social media, Yelp, Angie’s List, and everything else a small problem with $100 job can bring you down from a 5 star to a 4.5 star which can then lead to 100 less page views a month on your website. That’s a huge deal because we can be talking about thousands and thousands of dollars lost in business due to your pride or due to the fact that you think you’re right.